Custom plantation shutters provide a dramatic look that can last through years of changes in design. Whether it’s Vinyl, Composite or Hardwood shutters, these window treatments will provide that jaw-dropping effect for your St. Louis area home. Real wood or composite shutters from Graber add a classic look to your St. Louis, Missouri home. The natural beauty from real wood shutters are sure to make a statement in your home. Composite shutters are built from durable materials that are meant to last. Learn more now about wood and composite shutters from Graber, and get a free consultation now. Natural beauty that is 100% sourced from North America. Graber Traditions Wood Shutters are hand crafted in a variety of custom styles, a quality investment that is sure to add value and unique style to your home. Distinct grains from basswood trees are processed in Grayling, Michigan via sustainable forest management practices. Graber’s green philosophy utilizes sawdust and other waste to fuel processes and heat facilities for the company. Composite shutters from Graber let you give the look of real wood but include the durable materials that will last you decades. This cost effective shutter solution can withstand high humidity which is perfect for rooms including your kitchen, bathrooms and even your laundry room. The composite material resists flexing and multiple color options give you the choice of virtually any look you can imagine. Multiple styles include Standard Panel, Cafe, Bypass Track Systems, Double-Hung, Arch/Angle Top, and French Door solutions. Real wood, Polysatin™ and Hybrid shutters from Hunter Douglas are top-of-the-line quality and style for your St. Louis, Missouri home. The real wood Heritance Hardwood shutters are plantation style that are available in different stain and paint finishes to match your interior. 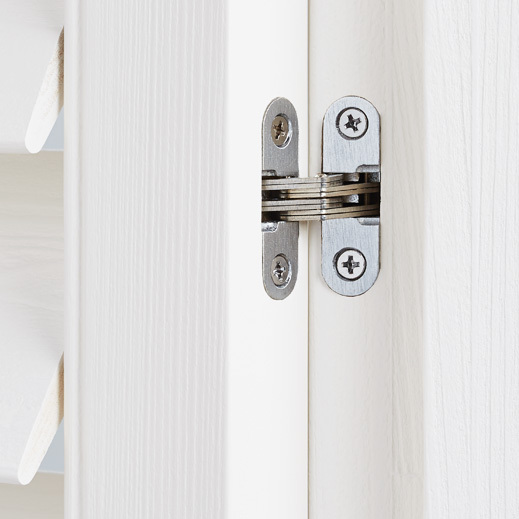 Palm Beach™ Polysatin™ shutters are made of UV resistant material that are guaranteed never to warp, crack or fade. Newstyle® Hybrid shutters blend real wood looks with the durability of modern-day materials that create a stunning look in any room. Learn more about Wood, Polysatin™ and Hybrid shutters from Hunter Douglas, get a free consultation for you St. Louis, Missouri home now. Classic Heritance® hardwood shutters are plantation-style shutters crafted from real wood and use dovetail construction for maximum strength and durability. Available in a large selection of stain and paint finishes to match anything in your St. Louis, Missouri home. Learn more about Heritance®Hardwood Shutters. Our Palm Beach™ Polysatin™ shutters are plantation-style shutters constructed with UV resistant Polysatin compound, so they’re guaranteed never to warp, crack, fade, chip, peel or discolor, regardless of extreme heat or moisture in the St. Louis area. Learn more about Palm Beach™ Polysatin™ Shutters. The NewStyle® Hybrid Shutters are plantation-style shutters that blend the beauty of real wood and advanced modern-day materials to create a stunning and durable window covering for any room. Learn more about NewStyle® Hybrid Shutters. Premium Faux blends the strength, stability, and precision of man-made materials with the beauty, character and elegant feel of real wood. Premium Faux shutters are beautifully engineered wood substitute shutters, and are manufactured with the best compound and highest technology. When harsh environments in the window are a question turn to Premium Faux as your solution. The Exus signature shutter offering, Linden Tree shutters, are made from 100% furniture grade hardwood and is available in 15 standard paint finishes and 15 standard stain finishes. Insist on furniture grade hardwood, know the construction of your shutters, get the most value from your investment. Linden Tree shutters by Exus. Where Nature Comes Home. Available in 15 standard paints, 15 standard stains or any custom color of your choice as well as 15 unique frame options to choose from. Popular in the South, countless homeowners have chosen to adorn their windows with Sonora shutters by Exus. Tuscan double finish for those that love to surround themselves with the essence of rustic farmhouse villas of the rolling Italian countryside or the warmth and peace of a Mediterranean garden home. For Home Décor with a more rustic farmhouse feel, we suggest accenting your Venicci shutters with oil rubbed bronze or antique brass hinges. Tuscan Décor can be very upscale or more comfortable and less formal. Either way, you will demonstrate your classic sense of style when you decorate your windows with the beautiful Venicci shutters.